PHOENIX -- When he came out of UC Irvine as the ninth overall selection in the 2017 Draft, everyone knew Keston Hiura could hit. Two years later, it's looking like he can do it all. And while he'll open this year in Triple-A, the young star may soon be showing off his skill set in Milwaukee. Hiura is coming down to the final days of his second big league camp in as many full professional seasons, and like virtually everything else in his career so far, he's handled it with seeming ease. 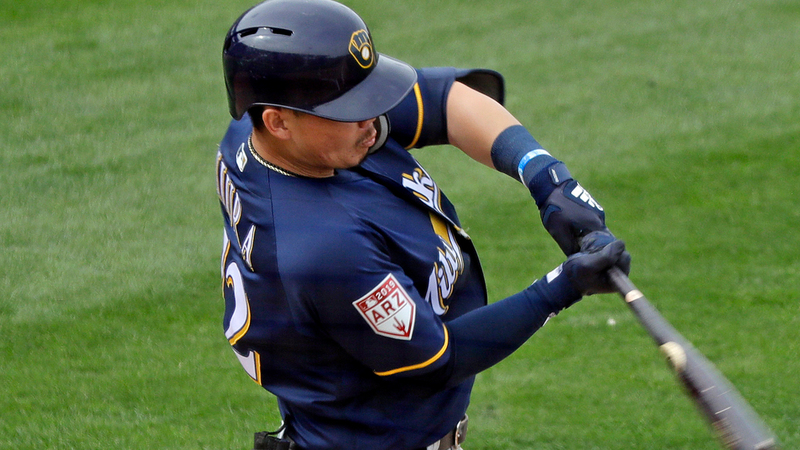 "Last year it was more getting to know the guys, getting to know how things ran up here and the mentality of players and the coaching staff, what needs to be done, what it takes to be able to play in the big leagues," Hiura said Thursday in the Brewers complex at Maryvale Baseball Park. "That was more of an observant period. This year, I'm more comfortable, more acclimated to schedules and how everything works around here. It's been really fun. I've gotten to know a lot of guys really well." If his climb through the Crew's system is any indication, Hiura won't be waiting long before he's applying those lessons and developing those relationships even more in the Majors. After crushing Rookie-level AZL pitching to a .435/.500/.839 clip in 15 games his Draft year, baseball's No. 20 overall prospect finished the year with a .333/.374/.476 line in 27 contests at Class A Wisconsin. Last season Hiura was even more masterful, storming through May with a .377/.437/.664 line in 29 games to erase a cool start the previous month and earn a ticket from Class A Advanced Carolina to Double-A Biloxi. Following a stellar showing in 73 Southern League games, the 22-year-old is preparing for the Minors' highest level but has the same internal goals in mind. "Last year it was to stay healthy. This year, it's stay healthy," Milwaukee's top prospect explained. "That's been a number one priority for me, being able to take those measures to be able to play every single game 100 percent and give it all. That was something I learned last year about how to take care of my body, how to prepare myself before games, after games, on bus rides. There's always something to get better on offensively, defensively. Especially when you play at the higher levels, you've got to limit the mistakes, limit the mental errors, make everything natural, everything routine." Hiura was the leading hitter in NCAA Division I baseball his junior year at Irvine with a swing that MLB.com refers to as "a thing of beauty," batting .442/.567/.693 with eight homers and 42 RBIs in 56 games. The bat was never an issue for the Valencia, California native. Concerns about potential issues with his throwing elbow and where he would play in the field worried some teams, but the Brewers are happy beneficiaries of that. Milwaukee set up Hiura at second base, where he has thrived. "All high school I was an infielder," he said. "In college, I was still considered an infielder, but I played mostly outfield. I was still taking ground balls, working on my live reads, in-game plays. It's more just getting as many repetitions as I can over at second base at this level. Players are hitting the balls harder, you're playing different shifts, throwing from different areas, different parts of the field. Just more getting comfortable with those and making those plays routine, kind of looking back from when I was drafted until now, that's something I've progressed a lot on." The Brewers narrowly missed the playoffs in 2017, finishing a game back of the Rockies for the National League's second Wild Card slot. Last year, they left nothing to chance, edging the Cubs for the Central Division crown and making it to Game 7 of the National League Championship Series. Hiura has seen a team that lost 89 games the year before he was drafted reshape itself into one of the heavyweights in the Senior Circuit. "That's something that really stuck out to me from what I saw last spring was how close this team was, how respectful they are of one another, that they're willing to go to battle for one another no matter what," he said. "That was really cool to see and be part of during the spring. Especially coming off that playoff run, it's like an extra chip on their shoulder. They want to get better. They want to get to the World Series and win. So far they've taken every step to get to that point or put themselves in that position to get there." As a Spring Training contributor, Hiura has made his mark. In 38 Cactus League games over the last two seasons, he boasts a .333/.387/.551 slash line, numbers that are pretty close to his career marks of .313/.374/.502 in 165 Minor League contests. "I'm grateful to be getting this opportunity just to come back here this spring and play with these guys, learn from these guys, learn from the coaches, play against big league talent," he said. "For all that, I'm really grateful for this opportunity. It's been a really fun spring so far, especially being able to watch what they did last year and see how it ended. You get that feeling when everyone showed up here, they were ready to work, ready to get after it." When the San Antonio Missions play their first game as a Triple-A club on April 4 at Oklahoma City, they'll boast Milwaukee's top prospect. Missions fans might want to grab tickets soon because given Hiura's track record, his stay in the Pacific Coast League may be short. "It'll be cool when the time comes," he said. "Right now, I can only control what I can control, give my best effort and attitude to San Antonio. My goal is to do whatever I can to help the team win there, and if [the Brewers] need me, of course I'll be excited for that moment to take it all in, cherish those moments and do what I can to help contribute at that level."